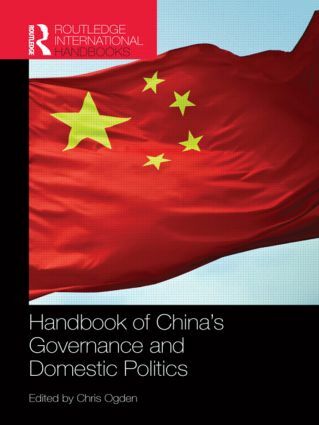 This Handbook provides an in-depth overview of how China is governed, how its domestic political system functions and the critical issues that it currently faces. Governed by the world’s largest political party in the world’s longest-ruling Communist regime, China is undergoing a transitional period of rapid economic and social development. How this period is managed will have significant implications for the Chinese state and its population concerning China’s governance structures and economy, as well as the country’s justice, public health, education and internal/external security concerns. This transition to a modern state is not without its challenges – particularly in terms of how the Chinese state deals with diverse issues such as social inequality, corruption, separatism, increasing individualism and political reform. China’s governance and domestic politics also have possible major global consequences, especially in the context of China's continued rise within the international system. This Handbook will improve understandings of the core national dynamics of this rise and, as levels of international interdependence with China increase, can offer vital insights concerning China's domestic attributes. Gaining a better knowledge of China's internal workings can also help better appreciate the multiple and varied problems that China’s leaders will face in the coming decades. Critically, many of the core internal issues facing China also have potential external repercussions, principally in terms of rising social unrest, nationalism, environmental degradation, resource shortages and attitudes towards globalization. This book aims to cover these issues and will help readers to fully comprehend China’s ongoing contemporary global significance. Chris Ogden, the editor, is Lecturer in Asian Security at the University of St Andrews, United Kingdom. His research interests focus on the interplay between domestic and foreign policy influences in East Asia (primarily China) and South Asia (primarily India).